ODD seminar on Lauder & Marynissen – Normal chaos: A new research paradigm for understanding practice » Triple E.D. 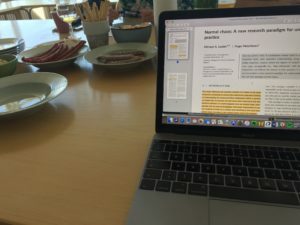 Yesterday Thomas arranged a seminar where we discussed Lauder & Marynissen´s article “Normal chaos: A new research paradigm for understanding practice” published in “Journal of Contingency and Crisis Management”. The conclusions were mixed but one take away is that what they describe is an old, universal problem. The battle between theory in use, and espoused theory if one will. The issue is what to do about this knowledge. That is yet to explore. This entry was posted in Extreme contexts, Method, Seminar. Bookmark the permalink.